Were you looking for Kansas City Truck Accident or Missouri Truck Accident or Springfield Truck Accident or St. Louis Truck Accident lawsuits? 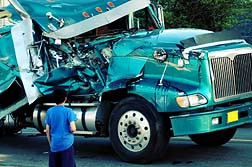 Send your Truck Accident claim to a lawyer who will review your claim at NO COST or obligation. According to the US Department of Transportation (DOT), in 2008 there were 4,229 fatalities in large-truck crashes. Of those, 3,139 people were occupants of other vehicles, 677 were occupants in the truck and 413 were not occupants in any vehicle. In 2007, there were 4,822 fatalities in large-truck accidents. Of those, 3,608 were in other vehicles, 805 were occupants in the truck and 409 were not occupants in any vehicle. When large trucks are involved in multi-vehicle accidents, it is more likely to be the occupants of other vehicles that are injured or killed rather than the truck occupants. This is due in large part to the size difference of the vehicles. Passenger vehicles are much smaller than semi trucks, leaving occupants vulnerable to serious injury. Truck drivers can also suffer serious, life-threatening injuries linked to defects in trucks or loads shifting. In some cases, large truck cabs may crush in a rollover, failing to properly protect the driver from serious injury. In other cases, seatbelts fail to latch properly and do not keep the driver securely in his seat. Meanwhile, cab guards may fail and allow cargo to move forward in a crash, crushing the cab from behind. If a driver's injuries are the result of a manufacturing defect, the truck driver may be able to file a lawsuit against the truck manufacturer, the maker of component parts or the trucking company that hired the driver. Negligence occurs when a person's actions or inactions fall short of what a reasonable person would do to prevent a foreseeable risk of harm. Negligence in truck accidents takes a variety of forms. These include failure to stop at a light or stop sign, failure to yield to another vehicle, failure to yield to a pedestrian and driving while distracted (including talking on a cellphone). In the case of commercial trucks, negligence can also include driving over the legal hours, not getting enough rest time, driving while tired, use of various prescription drugs, speeding, performing illegal maneuvers and failure to take proper evasive maneuvers to prevent an accident. In cases of injury or death caused by negligent driving, the injured party or his family may be able to sue the driver of the commercial vehicle, the owners and/or operators of the vehicle and the people responsible for the truck's maintenance. Claims can include negligence, wrongful death and personal injury. Defective automotive parts can play a role in serious truck accidents and can result in harm to a vehicle's occupants or other people on the road. Issues with commercial vehicles include faulty brakes, defective back-up alarms, engine problems and steering problems. In the case of injuries caused by truck defects, the injured party may be able to sue the maker of the defective part, the truck manufacturer and the companies or individuals responsible for repair and maintenance of the vehicle. Federal Motor Carrier Safety Regulations set limits and guidelines for truck drivers with regards to drug and alcohol use. Under the guidelines, truck drives may not use alcohol or be under the influence of alcohol within four hours of going on duty or operating a commercial motor vehicle. 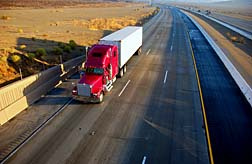 Furthermore, truck drivers are disqualified if they drive a commercial vehicle with a blood alcohol level of 0.04 percent or higher, or if they are under the influence of drugs. Refusal to take a drug or alcohol test also disqualifies the driver. Other causes of semi truck accidents include inadequate driver training, overweight vehicles, dangerous or reckless driving, poor driving conditions, failure to leave adequate room between vehicles and driving aggressively. If you or a loved one has suffered from a truck accident, you may qualify for damages or remedies that may be awarded in a possible class action or lawsuit. Please click the link below to submit your complaint to a lawyer for a free evaluation. Driver Dies from Horrific New Jersey Truck Ac.. Many Questions Remain About Horrific FedEx Bu.. Families of West Virginia Truck Accident Vict.. The piece fractured my skull and removed my right ear. Neck problems and pain along with ringing in the ear have persisted. I have had neck surgery, PTSD, fibromyalgia and migraines since the accident. I have been unable to work or do many daily activities.